We Do the Math: When Is It Worth Hiring Household Help? 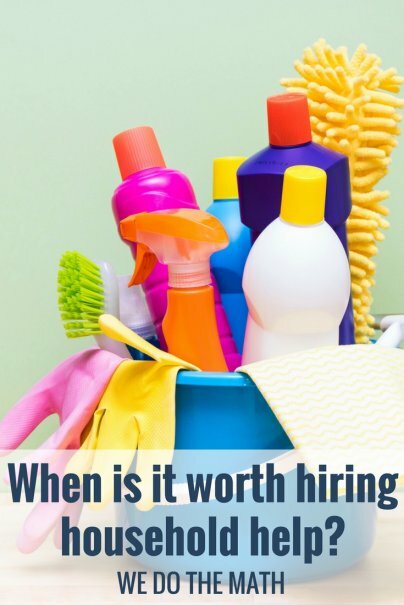 Home » Frugal Living » Budgeting » We Do the Math: When Is It Worth Hiring Household Help? How much is your happiness worth? Turns out, it may be available for a very reasonable hourly rate. A recent study shows that using money to buy yourself free time — by outsourcing household chores, for example — can lead to higher life satisfaction. Here are six common household chores that might be worth the investment to have someone else handle. What's the average amount of time you spend keeping your house clean? A small apartment might require only an hour of focused cleaning a week. However, if you live in a bigger home, or have multiple family members making messes around you, the time you save on hiring someone to do the cleaning can be significant. According to the American Time Use Survey, women spend about 30 minutes daily — or 3.5 hours weekly — on interior cleaning; men average spend about 10 minutes a day, or just over an hour per week. Think about where you fall in that time spectrum. I spend more time cleaning up on a daily basis, but my husband (and kids) all pitch in two to three hours to clean up on the weekends. The average cost of having a typical single-family home cleaned is $130, or you can arrange it by the hour, typically from $25 to $35. I have four kids, so I spend a lot of time doing laundry. And I had no idea that laundry services are as available, or cheap, as they are. There are about 35,000 laundry service companies in the U.S. Laundry service is generally billed per pound (of laundry), ranging from about $1 to $3 per pound. The variation in price is mostly due to regional location and the service. Some people love doing laundry. I do not understand these people. I do an average two loads of laundry (about 15 to 20 pounds) per day to keep up with my family's unreasonable clothes-wearing habits. It's about 20 minutes of my day to gather, wash, and dry that laundry, and another 15 to 20 minutes to fold and put it away. I'm spending over four hours a week taking care of clothes. Verdict: Outsourcing the laundry for under $1 per pound sounds like a great trade for more time and happiness. If your local rates are over $1 per pound, however, the service costs would add up quickly. For an individual or couple, the price would probably still be worth the time saved. However, when you factor in a couple of kids who dirty clothes at an alarming rate, the volume of laundry would create a service cost too high to justify. Food preparation may be one of the household chores that takes the most time. However, since it's typically handled in three separate tasks a day, you may not notice how much time you spend on it. Meal delivery services offer an alternative to spending all your time in the kitchen. With a meal prep service, you save the time you'd spend planning the meal, shopping for ingredients, and preparing the ingredients. These meal services often cater to specific dietary needs, and prices vary accordingly. Single meals cost anywhere from $6 for a kid's meal, to $16 each. Packages or subscriptions are the best value, but expect to pay anywhere from $70 for six meals to $152 for 10 meals delivered weekly. The average cost of a yard care service varies, but a typical suburban lawn will run about $60 per mowing. Many services offer a monthly plan, which average $100 to $200. The bigger your yard, the more it will cost to have it maintained; of course, that's also more time you're saving when you don't do it yourself. Verdict: For most people, a yard care service is a worthy investment. You save time on the yard work itself, save on the cost of owning and maintaining equipment; and, if you contract with a service for the whole season, you'll often get extra services (such as end-of-year leaf collection) included for little or no additional charge. What about the odd jobs, like cleaning the kitchen appliances (bleh!) or assembling that new desk you bought from IKEA? Organizing, deep cleaning, assembling, and installing stuff you've bought can take hours of your life. Fortunately, there are people who will do that for you. Faster. And probably better. Outsourcing services like TaskRabbit make finding these amazing people much easier. Create an account, and scan for a service provider who has the skills you need. But first you need to know what you're willing to spend. Start by clearly defining the task that needs to be accomplished. "Deep cleaning" is too vague; instead, list the specific tasks that need to be done. Next, estimate the time you'd spend completing each task. Now you can compare your estimated time cost to the hourly or project cost of hiring someone to do the job for you. If you can pay someone an hourly rate of $35 to do in a couple hours what might've taken you a full day, you've made a wise investment. Expect to pay $15 to $35 an hour for basic jobs that don't require special skills. Odd jobs that require lots of muscle (moving) or a specialized skill (carpentry) will range from $75 to $150 per hour. Verdict: Absolutely worth it for jobs you hate or aren't good at doing. I'll move into a new house before I clean the stove; hiring someone to do it for me at $20 per hour is a win. Having a clean, sparkling car is a great feeling. Doing it yourself, however, is not so great. It can take a good chunk of your Saturday afternoon to wash, wax, vacuum, and so on. The cheapest way to outsource the car washing errand is to hire a neighborhood kid (or your own kid) to do the work instead. While you can charge a small amount for this task to be completed, the work might not be all that thorough. A car wash service can provide a fabulous car wash, even detailing, for a fraction of the time required to do it yourself. Waterway, for example, provides a $35 car wash that includes "attention to detail, sparkle and shine, inside and out." That's not exactly detailing, but for $35, it's worth the two to three hours you'd save doing it yourself. Most car wash services offer subscriptions or packages which can lower the cost per wash, or give you unlimited washes per month for a single monthly cost (from $22.99 to $49.99, for Mister Car Wash). Verdict: With a monthly package or subscription, it's a good purchase. Find out what's available in your area. If you'd spend an afternoon cleaning your car, you can save that time — and wash your care more often — for a very reasonable price.